It was during World War II that the Kelly-Springfield Tire Company in Cumberland, Maryland was involved in the production of 8-inch M106 and .50-caliber shells. Dorothy Mellotte of Ridgeley served as a shell inspector at the factory. She, along with her late friend Emma Jean Smith, were among the twelve women who served as shell inspectors during her time at Kelly-Springfield. "Dorothy Mellotte of Ridgeley is a true Rosie the Riveter. She was a shell inspector at the former Kelly-Springfield Tire Co. from January to July 1945 during World War II. Between 1941 and 1942 the facility was transformed from a tire factory into an ammunition factory that was the production site of 8-inch M106 shells and later .50-caliber shells, according to the National Park Service Historic American Engineering record. When Mellotte went to apply for the job at Kelly-Springfield she was told she was too small. "I went back in a couple of days and said to Mr. Borda -- he was the man in charge -- I can do the job, and he said, 'OK' and hired me," said Mellotte, who was 19 at the time. "He didn't think I could handle those shells but they were all on pulleys. I'm a person that when someone says I can't do anything I will at least try." Women who supported the war effort through their work are often referred to as a Rosie the Riveter. On Dec. 27, 1941, Kelly-Springfield received an invitation from the Army Ordnance Department to submit a proposal for the manufacture of a substantial quantity of eight-inch, highexplosive M106 shells, according to the record. In January 1942, Kelly-Springfield's bid was accepted and the company was awarded a contract to manufacture the shells. The company earned the Army-Navy highest efficiency award for its M106 production and when contract was terminated in July 1945, Kelly-Springfield had produced 383,795 eight-inch shells. Mellotte's job was to inspect the width and the length of the shells to ensure that they were up to specification. Once the shells were painted, Mellotte had to ensure that there weren't any imperfections inside the shells that could render them useless. "There were times when I had to go out to the box car as they were loading and count them," said Mellotte. "It was fun because you worked with a Kelly guy, there was two of us on a bench. I helped inspect the shells and my husband helped shoot them." Mellotte still bears a scar from an accident that occurred while she was inspecting the shells. "You had a stamp that you had to put it on the shell and while I was hammering it on the shell this piece flew off and hit me in the finger. I had to go to first aid to get it out," said Mellotte. Mellotte worked with about 12 other shell inspectors and remained in touch with her friend the late Emma Jean Smith of Cumberland. "I loved the job. They were very, very nice and it was easy once you learned," said Mellotte." 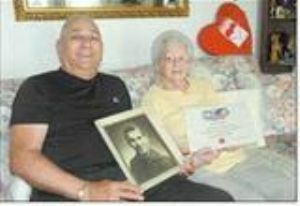 Photo Caption: Richard Mellotte holds a picture of his father, the late Frank Mellotte, a World War II veteran, and Dorothy Mellotte holds up a certificate for her contribution during World War II as an employee of the Pittsburgh Ordnance District. Dorothy was an M106 shell inspector from January to July 1945 at Kelly-Springfield.